Today, we are learning about Johannes Vermeer. He was a painter in the Dutch Golden Age. Let’s talk a little about this to understand his art. The Dutch region (Which is approximately where the Netherlands are today) was in a unique position for an art revolution. This came to be called the Dutch Golden Age or Dutch Renaissance. It was the North’s answer to the art changes of the Renaissance that we talked about with Botticelli (Who lived about 100 years earlier). -history painting, including allegories and popular religious subjects. -landscape, including seascapes, battle scenes, cityscapes, and ruins. 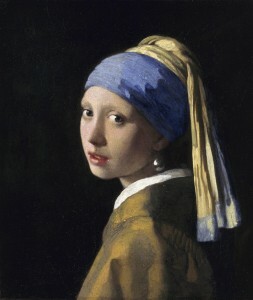 Vermeer was born on Oct. 31, 1632 in Delft, Denmark. Not much is known about his personal life. He never left Delft and was thought to have devoted a great deal of his time to his work. He was later called the Sphinx of Delft because his work became popular again in the 1900s, but there isn’t much information to tell us about the painter. His father was an art dealer and inn owner, and Johannes inherited this business when he died. He married Catharina Bolenes and converted to Catholicism, which influenced his art. (For older: as mentioned before, the Netherlands were protestant. Religiously, Catholicism had much more symbolism and pomp. Think back to Botticelli.) They had 15 children, 11 surviving past childhood. None of them were artists. Due to the Dutch Revolution, economic crisis hit his city of Delft. Over 5 years passed before circumstances improved. 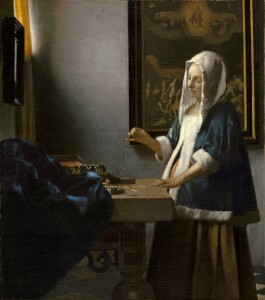 Vermeer died in December 1675. His wife, Catharina blamed his death, the war with France, not being able sell any paintings and being in debt. “He had fallen into a frenzy, in a day and a half he went from being healthy to being dead.” Modern scholars believe he had a stroke. Vermeer did not have formal training that we know of. (This is a subject of debate for experts, but no one has definitively traced his style to another master in the area.) There is limited evidence that Vermeer used preparatory sketches or tracings in his paintings. Vermeer is known for his use of light, his paintings have direct light sources and intricately detailed shadows. He was very interested in the camera obscura that had recently been invented. And his interest in photography influenced his work. These details are what make Vermeer’s work as compelling today as it was in his time. Take a look at the detail of his paintings and the expressions of his models.<Look at paintings> Girl with a pearl earring has inspired a handful of fictional stories and novels, it is interesting to imagine what she was thinking. The model in woman holding a balance is Catharina; Vermeer used his wife and children in many of his paintings. What do you think about these scenes? What do they tell you about life in the Netherlands in the 1600s? Would you like to be in one of these scenes? Etc. Today we will work on tag board. This has more texture to it, which shows through and changes the look of your art a little. Like Vermeer, we will do a genre painting. However, think back to Norman Rockwell and compare his detailed illustrations to these paintings. We will want to keep our scenes more simple. When you are painting, often simpler is better. Here are a few tips about how artists use paints. >First you will lightly sketch your subject. Do not put all of the details. We are “roughing it in” like we did on our Botticelli tando. >These are acrylics. They are very versatile, they can look like watercolors or more opaque, like oils. Today, we will “paint dry” which means we will be using less water. This will let the texture of the tag board show through a bit. >Dip your brush in the water, then gently wipe the excess water on the rim. >Dip the brush into the paint, but only on the tip! Brushes are meant to be used softly on the page, if you get paint up on the top of the brush or the barrel, it won’t be usable and can make the brushes loose their shape. >As always, work from the background up. Remind them that this lets you build up the details. Put in the sky, then your trees, then people, then faces etc. *We are limited on tag board so please encourage kids to keep working on their piece instead of starting again.